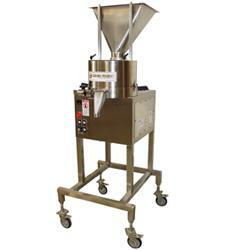 Volumetric fillers are used for filling of powders and some granular products. 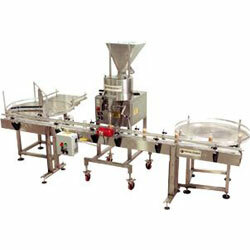 Volumetric filling offers higher speed filling and more dust control. The Model A series offers volumetric fillers that are more versatile and gentler on products than the standard auger feeder. 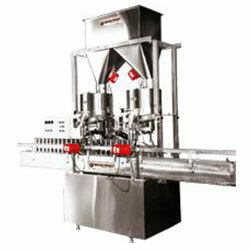 These systems handle a large range of powders and granular products like ground spices, seasoning blends, health powders, ground coffee, detergents, chemicals, drink mixes, cake mixes and similar products. 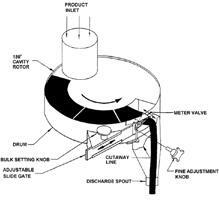 Product comes through the supply hopper inlet and fills a cavity in the rotor. As the rotor cycles the product is portioned out by the meter valve and streams into the container for gradual air displacement. This design puts negligible friction on the product, contains dust and no change parts are needed when changing package weights. Choose the model to the right that best fits your application.